Tour Scotland St Andrews Cathedral Archway, Fife, Scotland. 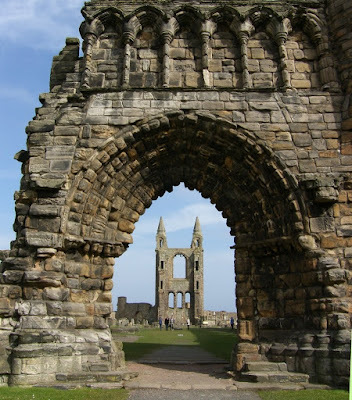 Of the many historical buildings of St Andrews, first to be noted must be the Cathedral, which founded in 1160 and then consecrated in 1318, was by far the largest church in Scotland before its destruction at the reformation. Tour St Andrews. Tour Aberdeen, Tour Edinburgh, Tour Glasgow, Tour Inverness, Ancestry Tour of Scotland. Best Scottish Tours, Best Scottish Food, Best Scottish Hotels, Small Group Tours of Scotland, Rent a Cottage in Scotland. Tour Isle of Skye. Tour Scotland. Ancestry Research Scotland, Birdwatching Scotland, Guidebooks Scotland, Edinburgh Travel Guides, Coast Scotland, Guidebooks Scotland, Scotland Maps, Self Catering Scotland, Scottish Whisky, Homecoming Scotland 2009, Scottish Highland Games 2009, Tour Scotland. Tour Scotland Outlander. Seven Day Tour included Aberfeldy, Amulree, Anstruther, Caledonian Canal, Castle Campbell, Clan Robertson, Clava Cairns, Culloden Battlefield, Dunfermline Abbey, Dunkeld, Dunkeld Cathedral, Dunkeld Hermitage, Dunfermline Abbey, Dunning, Dupplin Cross, Edinburgh Castle, Forth Bridges, Glen Quaich, Highland Scotland, Loch Ness, Loch Tay, Loch Tummel, Rosslyn Chapel, Ruthven Barracks, St Andrews, Struan Church, and much more. Tour Scotland Skara Brae. a large stone-built Neolithic settlement, located on the Bay of Skaill on the west coast of mainland Orkney, Scotland. It consists of ten clustered houses, and was occupied from roughly 3100 to 2500 BC. It is Europe's most complete Neolithic village and the level of preservation is such that it has gained UNESCO World Heritage Site status. Tour Scotland Most Haunted Castle. This castle has the reputation of being the most haunted in Britain, including Earl Beardie, the 4th Earl of Crawford who is said to have played cards with the Devil in a walled-up room. Tour Scotland Balcormo. Fife Point-to-Point steeplechases at Balcormo Mains. Tour Scotland Aviemore Railway Station. This railway station serves the town and tourist resort of Aviemore in the Highlands of Scotland. 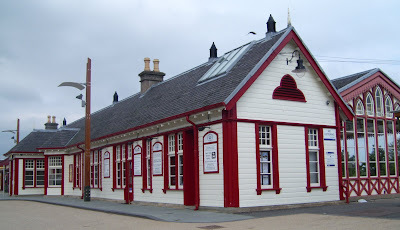 The current station was opened in 1898, when the "direct" line to Inverness via Slochd was built, making Aviemore an important junction and replacing the original 1863 building. Tour Scotland Megginch. 15th century turreted castle, not open to the public, with Gothic stable yard and pagoda dovecote. 19th century formal front garden, topiary and 1,000 year old yews. Splendid array of daffodils and rhododendrons. Walled kitchen garden and orchard. Tour Aberdeen, Tour Edinburgh, Tour Glasgow, Tour Inverness, Ancestry Tour of Scotland. Best Scottish Tours, Best Scottish Food, Best Scottish Hotels, Small Group Tours of Scotland, Rent a Cottage in Scotland. Tour Isle of Skye. Tour Scotland. Ancestry Research Scotland, Birdwatching Scotland, Guidebooks Scotland, Edinburgh Travel Guides, Coast Scotland, Guidebooks Scotland, Scotland Maps, Self Catering Scotland, Scottish Whisky, Homecoming Scotland 2009, Bargain Hotels Scotland, Scottish Highland Games 2009, Tour Scotland. 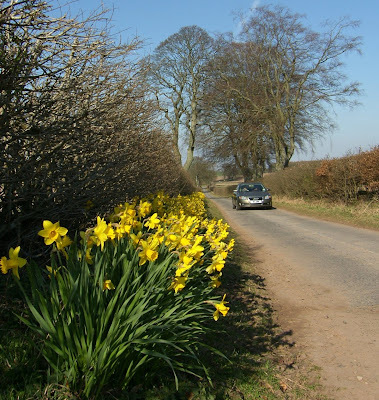 An April drive through rural Scotland from Rait, north to Balbeggie, Perthshire, Scotland. Tour Scotland Hopetoun. Hopetoun House is the traditional residence of the Earl of Hopetoun, later the Marquess of Linlithgow. It was built in 1699 and was designed by William Bruce, and extended in 1721 by William Adam. The house is located near South Queensferry to the west of Edinburgh, Scotland. Tour Scotland Glenalmond. This is a glen in Perthshire, Scotland. It is situated some twelve miles to the west of the city of Perth and forms the upper portion of the strath of the River Almond. Tour Scotland Russian Visitor. 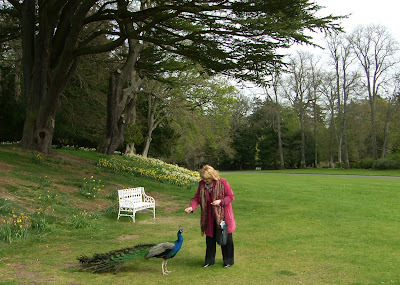 A visitor from Russia feeding a peacock today at Scone Palace, Perthshire, Scotland. 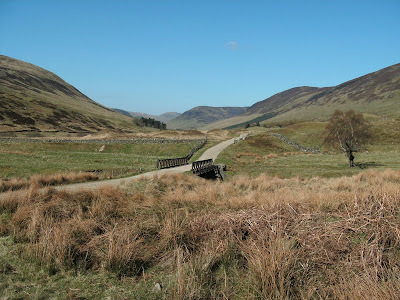 Tour Scotland West Highland Way. 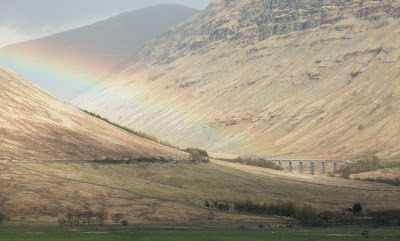 A gentle rainbow over the West Highland Way, a long distance footpath in Scotland, running from Milngavie north of Glasgow to Fort William in the Scottish Highlands, with an element of hill walking in the route. The path uses many ancient roads, including Drovers' roads, military roads and old coaching roads and is traditionally walked from south to north. As well as increasing the sense of adventure, taking the route in this direction keeps the sun from one's eyes. The route is traditionally walked in seven to eight days, although fitter and more experienced walkers do it in five or six. The route can be covered in considerably less time than this, but less hurried progress is the choice of the majority of walkers, allowing for appreciation of the countryside along the Way. Indeed, enjoyment of the natural surroundings of the walk are the primary motivating factor for many people following the route. Tour Scotland Rattray Parish Church. Rattray is on the east bank of the River Ericht, and Blairgowrie is on the west. 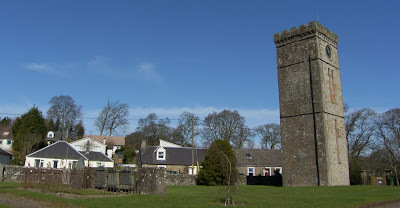 The town of Rattray, in Perthshire, dates back to the mid 11th century. The town, along with Blairgowrie, expanded greatly in the 19th century around the many jute mills on the river. These days Soft fruits such as raspberries, blueberries and strawberries are grown locally. The traditional ball game of Rattray no longer takes place, but the Rattray silver ball which was the trophy retained by the winners is still in existence. 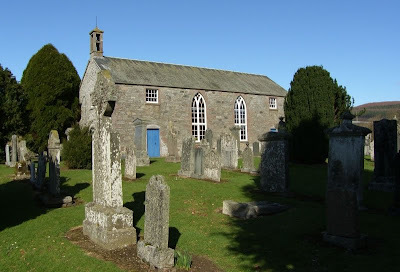 It is believed to have been donated by Sylvester Rattray of Nether Persie who became minister of Rattray in 1591 and continued there until his death in 1623. The Rattray silver ball is now kept at Perth Museum and Art Gallery. Tour Aberdeen, Tour Edinburgh, Tour Glasgow, Tour Inverness, Ancestry Tour of Scotland. Best Scottish Tours, Best Scottish Food, Best Scottish Hotels, Small Group Tours of Scotland, Rent a Cottage in Scotland. Tour Isle of Skye. Tour Scotland. Ancestry Research Scotland, Birdwatching Scotland, Guidebooks Scotland, Edinburgh Travel Guides, Coast Scotland, Guidebooks Scotland, Scotland Maps, Self Catering Scotland, Scottish Whisky, Homecoming Scotland 2009, Tour Scotland. Tour Scotland Speycasting Lessons. Jock Monteith is a highly experienced Scottish salmon ghillie (guide) who has more than 35 years experience in salmon fishing. Tour Scotland Inverkeithing Friary, Fife, Scotland. 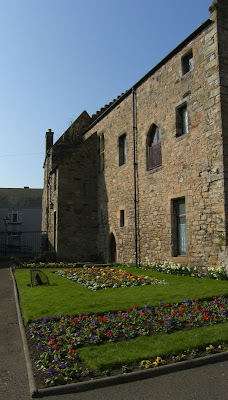 The late medieval building which was part of the claustral ranges of the Franciscan friary in Inverkeithing. This is one of the few remnants of a house of the Greyfriars to have survived in Scotland. In the garden behind the museum, some stone vaults survive which were probably storage cellars associated with the friary. The Battle of Inverkeithing, 20th July 1651, was fought in this area of Fife, close to Pitreavie Castle, during Oliver Cromwell's invasion of the Kingdom of Scotland following the Third English Civil War. This is considered of great importance to Clan MacLean, and the 20th century poet Sorley MacLean mentions Inverkeithing in one of his poems. The Russian admiral Samuel Greig was a native of Inverkeithing. Tour Scotland Kirkton Of Glenisla. 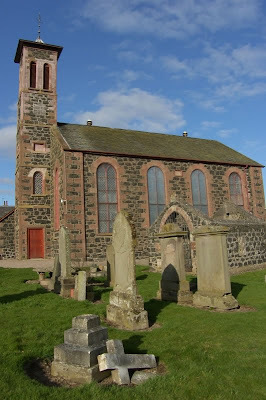 Although there is a history of the Church in Glenisla from 1275 the building of the present church dates from 1821. An amusing account of the church attendance in Glenisla in 1831 was written by Mr. G. Ure showing that not only the close proximity of the church and hotel but that both enjoyed the same patronage. " When in Glenisla in 1831 many of the last century customs still continued and a fine hospitable race they were. They travelled a long distance to the Kirk. They came before the bell rang and went to the public bar at the Kirkton Hotel, the men to have a dram of whisky and the women to have a taste of some cordial or small beer. When the bell ceased they all hurried to the Kirk." The incumbency of the Rev. Andrews (1806 – 1823) did much to strengthen the links between the church and the hotel. At the end of the Napoleonic wars the duty of spirits was greatly increases. When a party of excise men entered the glen they usually stopped at the hotel to rest and refresh their horses. The manse windows looked conveniently onto the hotel and all approaches to it. After the excise men were seen to be safely inside the Kirkton, Mr. Burns led his pony out and when out of sight galloped around the Glen and at every house and bothy waved his hat over his head shouting “The Philistines be upon thee Samson” - the smugglers responded to the call and dashed to the hills carring their illicit still, sometimes still steaming from recent use. It is said that when the stills were closed at the end of the 19th century, Glenisla lost almost half of its inhabitants. Tour Scotland Easter River Tay. Easter Sunday morning by the River Tay in Perth, Scotland. The River Tay originates in the Highlands of Scotland and flows down through Strathtay, in the centre of Scotland, through the city of Perth and into the Firth of Tay, south of Dundee. It is the longest river in Scotland. Blairgowrie and Rattray District Pipe Band parade into the town of Blairgowrie, Scotland, for the Easter Fair Celebrations. Tour Scotland Easter Bagpipers. The Blairgowrie and Rattray District Pipe Band at the Easter Fair in Blairgowrie, Scotland. Tour Scotland Blair Bells. Blair Bells, performing at the Easter Fair in Blairgowrie, Scotland. A team of Scottish handbell ringers who play a varied selection of music on a s-octave set of bells at rallies, concerts and church services. Tour Scotland Forter Castle. This Scottish castle, located in Glen Isla, was a former stronghold of the Ogilvies that was stormed along with Airlie Castle by the Campbells of Inverewe in 1640 on the instructions of Archibald Campbell, the 8th Earl of Argyll (1598 to 1661). Tour Scotland Castle Huntly. This Scottish castle is said to be haunted by a White Lady, a young woman dressed in flowing white robes. There are various stories concerning her history, one of which is that she was a daughter of the Lyon family who occupied the castle in the 17th century. She allegedly began an affair with a manservant at the castle, and when their relationship was discovered, was banished to a bedroom high up in the tower overlooking the battlements. Unable to endure her suffering, she threw herself, or was she pushed ?, to her death from the tower. The ghost of the White Lady has been seen a number of times over the years, often in the grounds surrounding the castle at night. She has also been seen in the bedroom in which she was imprisoned. The families that claim to have seen her report that she does not seem to cause fear and appears harmless. A second ghost who is claimed to haunt Castle Huntly is that of a young boy dressed in a double-breasted sailing jacket. He has been seen in the room from which the White Lady is said to have jumped and there is speculation that he may be the son of Colonel Adrian Gordon Paterson. The Colonel's only son Richard drowned in 1939 in a yachting accident on the River Tay. It is interesting that he should appear in the room occupied by the White Lady and it has been suggested that the presence of her ghost has somehow "tempered" the room so that other spirits can more easily appear there. 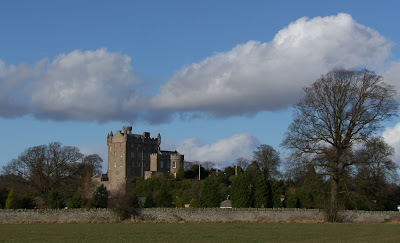 Castle Huntly sits approximately seven miles west of Dundee in the Carse of Gowrie, Perth and Kinross, Scotland. It is situated close to the shore of the Firth of Tay and can be seen from the main road linking Dundee and Perth. The castle sits on top of a rocky outcrop surrounded by what is now farmland. In ancient times this land was marshy wilderness and the decision to locate the castle on the rock may have been taken with a view to the castle's defensive position in mind. Castle Huntly was built around 1452 by Baron Gray of Fowlis under licence from James II of Scotland. The castle changed hands in 1614 when it was acquired by the then Earl of Strathmore who changed its name to Castle Lyon. In the 1770s, the castle was sold by the widow of the 7th Earl of Strathmore to George Paterson of the East India Company who also changed the name back to Castle Huntly. 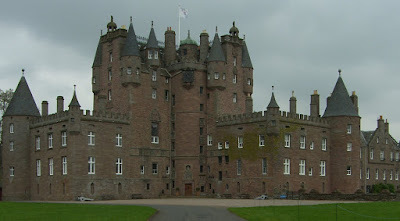 The castle left the hands of the Paterson family in 1946 after the death of Colonel Adrian Gordon Paterson when his wife sold the castle to the government. Castle Hunly is now known as HMP Castle Huntly and is one of only two open prisons in Scotland, and thus public tours are unavailable. Tour Scotland Braco Free Church. The freestanding Clock Tower, is all that remains of the Free Church which was erected at the time of the disruption in 1843. Tour Scotland Dollarbeg Castle. Located in Clackmannanshire, Scotland. The castle was built in the Scots baronial style and it was originally built for a Victorian railway tycoon. 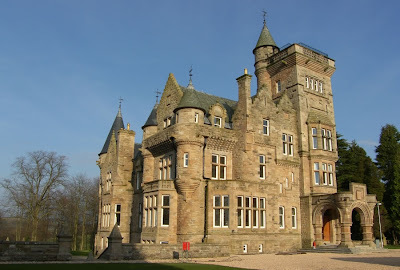 The Castle was designed by Stirling architect Ebenezer Simpson and built in 1889. Tour Scotland Dunfermline Abbey Church, Fife Scotland. Robert the Bruce was buried, in 1329, in the choir, now the site of the present parish church. 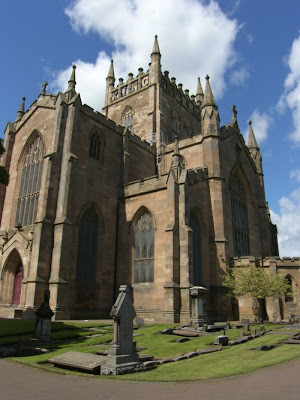 Bruce’s heart rests in Melrose, but his bones lie in Dunfermline Abbey, where, after the discovery of the skeleton in 1818, they were reinterred with fitting pomp below the pulpit of the New church. Tour Scotland April St Monans. An April video of St Monans and harbour, East Neuk of Fife, Scotland. St Monans or St Monance, is an old fishing village on the East Coast of Scotland, named after the legendary Saint Monan. Tour Scotland Glencoe Deer. Scottish Deer outside the Kings House Hotel in Glencoe, Scotland. Tour Scotland Applecross Road. In 1822 a road was built from Kishorn in the east and over the Bealach na Ba, or Pass of the Cattle, to Applecross, Scotland. The pass is sometimes called the Bealach nam Bo. This is a video of part of the drive down the pass from Applecross to Kishorn. Tour Scotland April Daffodils. A common sight by the roadside around rural Scotland at this time of year. Tour Scotland St Andrews Harbour. St Andrews in the Kingdom of Fife, is a matchless blend of past and present. As a town it has no equal in Scotland. Its ecclesiastical connections began at least as early as 747; the burgh came into being about 1144; the University, the first in Scotland, began in 1411. Golf was a recognized game there in 1552.